Good day. The green book tells us about the great men of the Bible who trusted God to help them in times of trouble. As you listen to this, turn to the next picture when you hear this music. Elisha was a great teacher and prophet of God in Israel. Elisha knew that God could do anything. 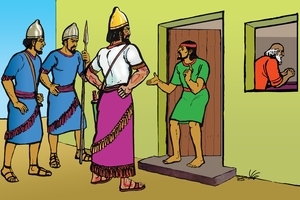 One day a man called Naaman came to Elisha's house. Naaman was the commander of the Aramean army. The Arameans were enemies of Israel. Naaman was a brave and powerful man, but he had leprosy (a skin disease). He came to Israel because he had heard that Elisha could heal his leprosy. But Elisha would not even go out to greet him. Elisha sent his servant to tell Naaman, "Go, wash yourself seven times in the Jordan (river), and your flesh will be restored and you will be cleansed." Naaman was angry and said, "I thought that he would surely come out to me and stand and call on the name of the Lord his God, wave his hand over the spot and cure me of my leprosy." So Naaman went away in a great rage (very angry). 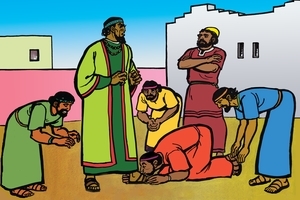 Naaman's servants begged him to turn from his anger and pride. 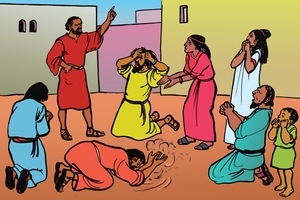 They persuaded him to obey Elisha's simple command. 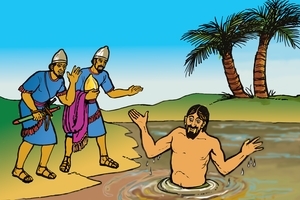 So Naaman went to the river Jordan and washed himself seven times. Look! Naaman is very happy. His leprosy is completely healed. At this time the Arameans were at war with Israel. God warned his servant Elisha every time when the Arameans were planning to attack Israel, and then Elisha warned the king. The king of Aram then commanded his soldiers, "Go and find out where Elisha is, so that I can send men to capture him." Early one morning Elisha and his servant went outside and they saw that the Aramean army had surrounded their city. The servant cried out, "Oh, my lord, what shall we do?" "Don't be afraid," said Elisha. "Those who are with us are more than those who are with them." Then Elisha asked God to open the servant's eyes. 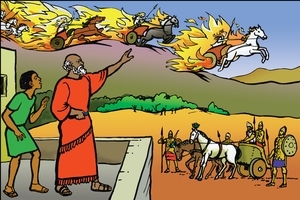 The servant looked and saw the hills full of horses and chariots of fire all around. They had been sent by God to protect them. Elisha knew that when God's servants obey Him, He would guide and protect them. That is why Elijah did not fear anybody. As the Arameans came down to take Elisha, he prayed to God saying, "Strike these people with blindness." Immediately all the soldiers were unable to see. Elisha went to them and said, "Follow me, and I will lead you to the man you are looking for." Elisha led all the men right into Samaria, the capital (chief) city of Israel. There Elisha prayed to God once more, "Lord, open the eyes of these men so they can see." Then the Arameans saw that they were in the city of their enemies. The king of Israel wanted to kill them, but Elisha said, "Set food and water before them so that they may eat and drink and then go back to their master." The king did as Elisha told him. The God of Elisha is greater than any enemy. God commanded us in his Word not to take revenge on our enemies, for God said, "It is mine to avenge; I will repay." God also said, "If your enemy is hungry, feed him; if he is thirsty, give him something to drink." Look! The king of Israel was walking on the city wall, when two women came to him. They begged the king to help them. They were so hungry that they were eating their own children. It was because the Aramean army again had come to fight Israel. They besieged the city of Samaria and soon the Israelites in the city had no more food to eat. The king did not know what to do. He was angry because God had not saved them from the Arameans. He decided to kill Elisha, the servant of God. Then Elisha sent this message to the king, "This is what the Lord says, 'This time tomorrow, flour and barley will be sold at the gate of Samaria.'" At that time four men sat at the gate of Samaria. All of them had leprosy. They said to each other, "Why (should we) stay here and die? . . . So let's go over to the camp of the Aramean army and surrender." Meanwhile the Arameans heard a great noise like an army coming. They were so afraid that they left all their things and fled. When the lepers came to the Aramean camp, there was no one there! 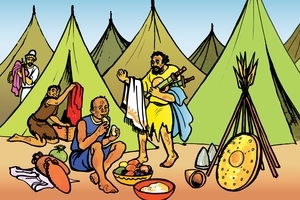 The lepers took food and anything they wanted. Then they said to each other, "We're not doing right. This is a day of good news and we are keeping it to ourselves." Quickly they returned to Samaria and told the news to the city gatekeepers who told the king's household. And soon the people were selling food at the gate of Samaria, as God had said through Elisha. After Elisha died, there was another prophet in Israel called Jonah. God said to Jonah, "Go to the great city of Nineveh and preach against it, because its wickedness has come up before me." The people of Nineveh were also enemies of Israel. Jonah did not want to go to them, so he tried to run away. He found a ship which was going to a far country. He paid his fare and the ship sailed away. But soon a great storm arose on the sea. The people in the ship were terrified. They said, "Come, let us cast lots to find out who is responsible for this calamity." So they cast lots and they found that Jonah was to blame. The sailors said to Jonah, "What have you done?" He told them that he was running away from the Lord. So they said to him, "What should we do to you to make the sea calm down for us?" "Pick me up and throw me into the sea," he replied, "and it will become calm. I know that it is my fault that this great storm has come upon you." 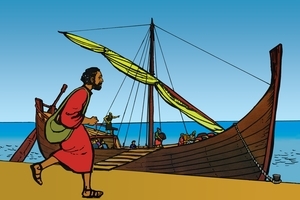 The men did not want to kill Jonah, but the storm grew worse, so they threw him overboard into the sea. But Jonah did not drown (die) in the water. Look! A great fish swallowed Jonah. For three days he stayed alive in the belly of the fish. Then the fish vomited (spat) Jonah onto dry land. God spoke to Jonah a second time, "Go to the great city of Nineveh and proclaim to it (and tell the people) the message I give you." 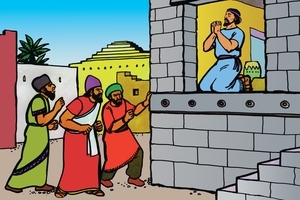 So Jonah obeyed God and went to Nineveh. He warned the people, saying, "Forty more days and Nineveh will be overturned (destroyed)." The king and all the people cried out to God to save them. They turned from their evil ways, so God decided not to destroy them. We are all like Jonah and the people of Nineveh. We have all disobeyed God and done evil things. We deserve punishment. But God loves us. He does not want us to go to hell, the place of eternal suffering. Therefore He sent Jesus to warn us, and to save us so that we might turn from evil. Jesus died for our sins. He was in the grave for three days, just as Jonah was inside the belly of the fish for three days. Then Jesus rose from the dead. Now He gives everlasting life to all who turn away from sin and evil and follow Him. This is good news and we should share it with all people. Esther was a young Jewish girl from the land of Israel. Her parents had died so Mordecai, her uncle, took care of her. 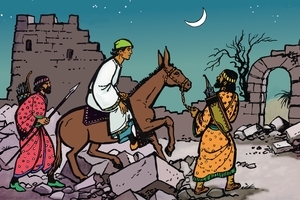 After a war, Esther and Mordecai were captured with all the other people of Israel, and taken away to the land of Persia. The king of Persia was a very powerful man. Everyone was afraid of him. When his queen displeased him, he decided to replace her. So he called for beautiful young girls in his kingdom to be brought to his palace (big house). And from among them all, he chose Esther to be his new queen. But Esther told no one that she was a Jew. In this picture we see a man called Haman, an important man in Persia. All the people had to bow down and show respect (give honour) to Haman as he passed by. 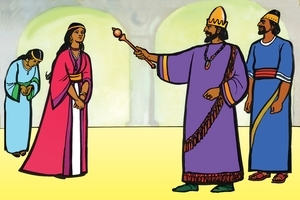 But Esther's uncle Mordecai refused to bow before Haman. Mordecai would only bow before the one true God and he worshipped Him alone. Haman was angry. He was determined to get his revenge on Mordecai. One day Haman told the king, "There is a certain people dispersed and scattered among the peoples in all the provinces of your kingdom whose customs are different from those of all other people and who do not obey the king's laws . . . " He was speaking about the Jews. Haman also said, " . . . let a decree be issued (make a law) to destroy them . . . " Haman offered the king money and the king granted his request, but he refused the money. A law was made throughout the Persian kingdom to kill all the Jews and take their possessions. Haman also had a great gallows built on which to hang Mordecai. 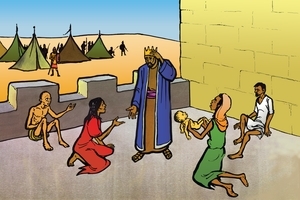 Mordecai asked Esther to go to the king and plead for her people. But Esther said, " . . . for any man or woman who approaches the king . . . without being summoned (called) the king has but one law: that he be put to death." ("If anyone goes to the king without being called, that one must die.") Esther asked the Jews in that city to go without food and without drink for three days and to pray to God for her. She and her servants would do the same. She also said, "When this is done, I will go to the king, even though it is against the law. And if I perish, I perish (die)." God answered the prayers of the Jews. 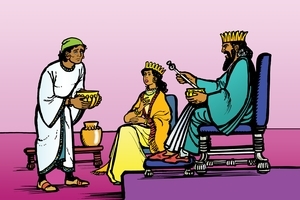 The king gave Esther permission to speak to him. She invited him to a special feast and invited Haman also. 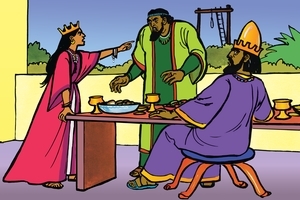 At the feast the king asked Esther, "Queen Esther, what is your petition? (What do you want?) It will be given you. What is your request?" Esther replied, " ...grant me my life - this is my petition. And spare my people - this is my request. For I and my people have been sold for destruction and slaughter ..." The kind said, "Who is he? Where is the man who has dared to do such a thing?" So Esther said, "The . . . enemy is this vile Haman." The king was so angry when he heard of Haman's wicked plans, that he had him hanged on the gallows which Haman had prepared for Mordecai. All the Jews were saved. Esther was willing to die, to save her people from being killed. But think of Jesus. He loved us so much that He died to save us so that we do not need to enter the place of everlasting punishment that we deserve because of our sins. If we believe in Jesus, we must also be prepared to tell other people about Him, so that they can be saved too. Two Israelite men called Daniel and Nehemiah were also forced, like Mordecai and Esther, to live in the land of their enemies. Daniel and Nehemiah also worshipped the one true God and they became great men of God. Remember to turn to the next picture in the book, when you hear this music. This picture shows Daniel and his three friends. They were also Jews or Israelites. They were taken to the land of Babylon by their enemies. 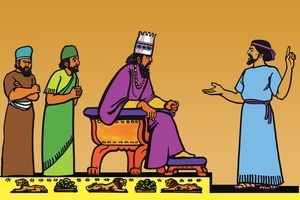 The king of Babylon wanted them to serve him. So they had to learn the language and the customs of Babylon. 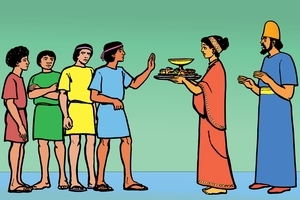 But Daniel and his friends refused to eat the rich food of the king. It was against the customs of the Jews. They wanted to keep God's laws and honour Him, so they asked for vegetables to eat and only water to drink. The man who kept them was afraid that they would get thin and sick (lose weight and become sick). But God cared for them and they became healthier and wiser than all the other men that served the king in Babylon. The king of Babylon, called Nebuchadnezzar, had a dream. He asked his wise men and sorcerers to tell him what he had dreamt and what it meant. But none of them could tell him, so he decided to kill them all. 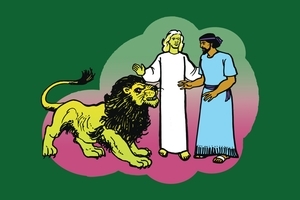 Then Daniel and his friends prayed to God, and God revealed the king's dream to Daniel. Daniel went to the king and said, " . . . there is a God in heaven who reveals mysteries. He has shown King Nebuchadnezzar what will happen in days to come." Daniel told the king that in his dream he had seen all the kingdoms of the world, and that he had also seen a greater kingdom that destroyed them all. That was the kingdom of God, which lasts forever. The king was pleased with Daniel's words. The wise men and sorcerers were allowed to live and Daniel was made governor (ruler) under the king over all of Babylon. All that happens in this world is under the control of this great God Daniel spoke about. Therefore we should not turn to sorcerers or witch doctors, but to God. We should trust Him to do what is right. The king of Babylon set up a huge image of gold. He called for all his officials to come and see the image. 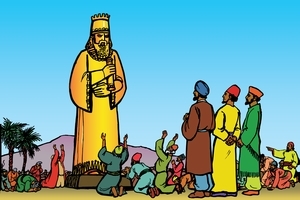 The king's servant then commanded the people there, saying, "When you hear the sound of the music, you must fall down and worship the image of gold that King Nebuchadnezzar has set up. Anyone who does not fall down and worship (it) will immediately be thrown into a blazing furnace (oven)." 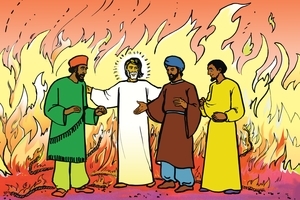 Daniel's friends Shadrach, Meshach and Abednego, refused to worship the image. They worshipped only God. They knew God's commandment that says, "You shall have no other gods before me. You shall not make for yourself an idol in the form of anything in heaven above or on the earth beneath or in the waters below. You shall not bow down to them or worship them". Some men went to the king and said, " . . . there are some Jews whom you have set over the affairs of the province of Babylon - Shadrach, Meshach and Abednego - who pay no attention to you, O king. They neither serve your gods nor worship the image of gold you have set up." The king sent for Daniel's three friends. He said to them, "If you do not worship the image of gold, you will be thrown into the blazing furnace. Then what god will be able to rescue you from my hand?" The men replied, " ... the God we serve is able to rescue us from it, and he will rescue us from your hand, O king. But even if he does not, we want you to know, O king, that we will not serve your gods or worship the image of gold you have set up." So Shadrach, Meshach and Abednego were thrown into the furnace of fire. Then the king cried out, "Look! I see four men walking around in the fire, unbound and unharmed, and the fourth looks like a son of the gods." When the three men came out of the fire they were not even burned. The king said, "Praise be to the God of Shadrach, Meshach and Abednego, who has sent his angel and rescued his servants! . . . for no other god can save in this way." Daniel had great power in Babylon. Some of the other officials were very jealous of him. But they could find no fault in him, for Daniel obeyed the king. So the enemies of Daniel went to the king and said, " . . . the king should issue an order (make a law) which says that anyone who prays to any god or man during the next thirty days, except to you, O king, shall be thrown in the lion's den." The king agreed with the men and he made the new law. Daniel heard of the king's new law, but he continued to pray to God three times a day as before. When his enemies saw him praying, they went to the king and said, "Daniel has not obeyed the law you made." The king did not want Daniel to die in the lions' den, but he could not change the law. So Daniel was thrown to the lions. Early the next morning the king ran to the lions' den and called out, "Daniel, servant of the living God, has your God, whom you serve continually, been able to rescue you from the lions?" And Daniel answered, "My God sent his angel, and he shut the mouths of the lions." The king was overjoyed. 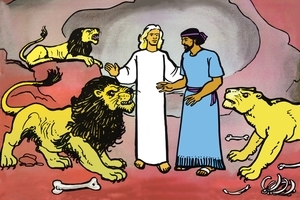 Daniel was taken out of the lions' den. At the king's command, Daniel's enemies were thrown to the lions and immediately the lions tore them to pieces. We need not fear what men can do to us. We should trust in the living God who helped Daniel and his friends. Even if men kill us, we still have hope, for Jesus came from God to give everlasting life to all who love and serve Him. 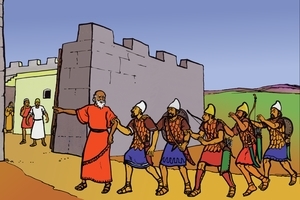 Nehemiah lived in Babylon after the time of Daniel. Nehemiah was also a Jew who trusted in God. 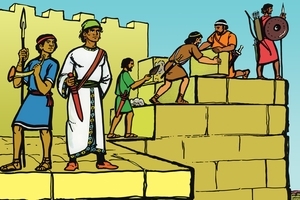 Nehemiah was the servant of the great king. One day as he served wine to the king, the king asked him, "Why does your face look so sad . . . ?" Nehemiah was sad because Jerusalem, the city of his ancestors, was in ruins and the Jews who lived there were in great trouble. So Nehemiah told the king about Jerusalem and its people, the Jews. Then the king said, "What is it you want?" Nehemiah silently prayed to God, and said to the king, "If it pleases the king . . . let him send me to the city in Judah where my fathers are buried so that I can rebuild it." God answered Nehemiah's prayer and the king granted his request and he also gave him building materials, and workers to help him. 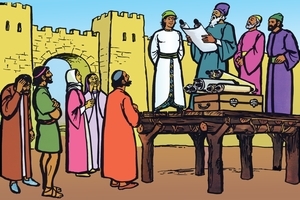 Nehemiah and his helpers travelled all the way to Jerusalem. Nehemiah first wanted to inspect the walls to see what the damage was. So he rode right around the city. He went by night so that nobody knew what he was busy doing, because the enemies of the Jews had heard about Nehemiah and his plans. They were angry. They did not want anyone to help the Jews. The next morning Nehemiah called the Jews and said, "Come, let us rebuild the wall of Jerusalem, and we will no longer be in disgrace (suffer this shame)." He told them that God was with him, and that he had the permission (approval) of Babylon's king. So the Jews replied, "Let us start rebuilding." The Jews began to work. Some cleared away the rubbish while others built the walls and set up the gates. The enemies of the Jews became very angry. They threatened to kill the workers. So Nehemiah prayed to God again, because he knew that all wisdom and power belong to God. He needed God to show him what to do. Then he placed armed men on the walls to guard the workers. Everyone took up arms (weapons) and prepared for war. The enemies were unable to kill Nehemiah or the other Jews. So the work went on and (in only 52 days) the wall was rebuilt. After the walls were completed, the Jews came together in Jerusalem. Ezra, the priest of God, read to them the law of God. It is written in God's Word, the Bible. Some of the people began to weep when they heard God's Word. They knew they had disobeyed God. That was the reason why God allowed the enemies to destroy their city. The Jews wanted to turn from their sinful ways and live according to God's will again. Nehemiah said to the people, "Do not grieve (Do not be sad), for the joy of the Lord is your strength." Do you have joy? God gives joy and spiritual strength when we know God and obey his Holy Word, the Bible. Let me tell you how you can also know the God of Nehemiah. He is the one true God. There is only one way to know God. God sent his Son, Jesus, to show us the way. Jesus lived on earth many years ago. He did many good things to help people and He showed us through his example how we should live to please God. But we have not followed his example, because we did not know Him before. All of us have sinned against God. God punishes the sinner who rejects his Word and his will. After that person's death, God sends him or her to hell, the place of everlasting suffering, away from God's presence. God's Word teaches us that He made the first man from the dust of the earth, so when we die, our bodies return to dust. But the human spirit, that is part of us, returns to God who gave it. Then we receive God's punishment or reward. Although Jesus had done nothing wrong on earth, God allowed wicked men to kill Jesus. 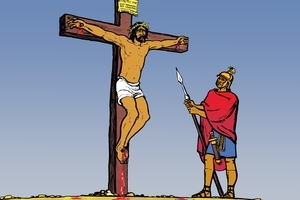 They nailed Him to a wooden cross. Because Jesus loves all people, He took the punishment for everybody's sins upon himself. Now if we repent, God will forgive our sins so that we can come to know and obey Him. For the true followers of Jesus there will be no punishment after death. They will love and serve Him forever. In this picture you can see two roads. When people keep on disobeying God, they are walking on a great wide road where Satan is the master of all evil. This road leads to the place of everlasting punishment. Everyone born on this earth enters this wide road. This also holds true for you and me. For God's Word says, "There is no one righteous, not even one; there is no one who understands, no one who seeks God. All have turned away, . . . there is no one who does good, not even one." It is also written, " . . . for all have sinned and fall short of the glory of God, ..."
Because all people are sinners, all deserve God's punishment. But God sent his Son Jesus to take the punishment on our behalf (instead of us). After that God raised Jesus from the dead and now He lives to show us the way back to God. Jesus said, "I am the way and the truth and the life. No one comes to the Father except through me." Those who follow the way of Jesus will not enter the place of everlasting suffering. We must follow the way of Jesus. This is a hard and narrow way. And because of the evil in this world, people will suffer on earth. But Jesus is always with those who follow Him, to give them strength. For the followers of Jesus, there is hope because the way of Jesus leads to heaven. In heaven there is no suffering, but everlasting joy and peace, for all those who go to heaven, will serve and love God and be in his presence forever. But Satan and all who follow his way will go to hell, the place of everlasting suffering. If you want to leave Satan's way and walk the way of Jesus that leads to God, you can pray like this: Father God in heaven, I am a sinner. Till now I have followed Satan and I have been driven forward by my own desires, bad thoughts and habits. Please forgive me. Thank you Lord Jesus for dying on the cross, taking the punishment for my sins. Thank you that your blood cleanses me from all sin. Lord Jesus, I receive you now as my Lord and saviour. Thank you that through your Holy Spirit you are giving me strength to become a child of God and to obey his Word. In the Name of Jesus I ask this. Amen. See different versions of this script in Afrikaans, Buhutu, Cantonese, Chinese Simplified, English, French, Herero, Indonesian, Kimwani: Ibo, Lomwe: Mozambique, Malagasy Merina, Ngonde, Northern Sotho, Pijin: Solomon Islands, Portuguese: Brazil, Portuguese: Mozambique, Russian, Sena: Mozambique, Shimaore, Shona, Spanish, Swahili: Tanzania, Takwane, Tok Pisin: PNG, Tonga: Malawi, Tsonga, Umbundu, Urdu, Venda, Xirima, Yao: Malawi, Zulu.